This place is pretty dated. It could use a major renovation. However, it's perfectly located and the people are nice. The prices aren't horrible and it's still pretty cool. We enjoyed staying in this historic hotel. It is old, but clean and the rooms were comfortable. The staff was friendly and helpful. Enjoyed having dinner at the hotel restaurant which has a balcony and outdoor seating. We were entertained by an excellent musician who sang and played guitar. The food was good and we had the best waitress we have ever had. Her name was Elena. She served us as if we were guests in our home. Location is great, if that is all you care about. Parking is a pain, not exactly clean and for the price, they need to update just a bit. had a great time !!! convenience was awesome !! plan on going back !! Outside pictures are accurate but inside pictures are not. Very old, which is quaint, but needs some updates, especially in the bathroom and lighting. Bed very comfortable. Parking is challenging, there is a shuttle, which sometimes was quite a wait. This was our second stay at this hotel. Overall, the location is excellent (right in the middle of downtown Eureka Springs) which is why we opted to stay here again. The hotel is old and could use some updating, but clean and consistent with the general "Victorian" feel of the town. My biggest complaint from our recent stay was that our rooms were located in the middle of the spa (as in, there were massage rooms on either side of us) making it a bit awkward to come and go, especially with children who we were constantly "hushing" as to not disturb massages. The higher Friday night rate did include breakfast on Saturday morning which was pretty good (included an omelet station which was nice). The staff was so friendly and helpful! They all seemed to enjoy their work. Older but very nice hotel located in the heart of Eureka Springs. Since our plans were to bar hop for my birthday, the hotels location made that very easy. Room was extremely nice and comfortable. The staff was outstanding, including but not limited to: Kerry, Curtis, Kristen, Chad, and the young man at the omelet station. Enjoyed our stay at the Basin Park. Walking distance to most everything we wanted to do. Only complaint is the rates went really high for the weekend! Almost way to high!!!! This hotel is in a beautiful old building in a charming downtown setting. However, that's about it. The room was tiny and cramped. The beds were comfy, but they took up 90% of the room. There was an armoire, but it was hard to open being so close to the foot of the bed. Since there wasn't a dresser, we had to put out bag on what looked like an old crate on the floor. The sink was in the room (not the bathroom) and was not very clean, and the room had very poor lighting. the bathroom was nice, but also quite small. The wedding reception was in a ballroom on the second floor. The room was also very poorly lighted, and also kind of dirty. During the reception water just started coming out of two of the light fixtures over guest tables. It was weird. Plus, we heard that the staff were rude and very unaccomodating to several of the wedding party's families. Overall, being a historic hotel is no excuse for being dilapidated and gross. The hotel was easy to find, right in the middle of town. The elevator was out of order when we arrived. The front desk clerk was very pleasant and knowledgeable. The carpet was new and the the bedding was excellent. The room had a nice view. There was no real theme to the the room except a hodge podge of furnishings.Too bad because the hotel has a lot of potential. A small shelf in the bathroom would have been nice for toiletries as it had a small pedestal sink with no place for toiletries. Although the electrical was very dated, at least they had added a couple of power strips the the night stand and dresser so there was a place to recharge your electronics. Very cool, old hotel with lots of charm! We enjoyed our stay there & especially the updated shower with the vintage feeling room. The balcony cafe was nice too & the complimentary breakfast was wonderful as we enjoyed the beauty of the town & surroundings! I Surprised my wife with a quick weekend trip to Eureka Springs, and the Basin Park Hotel for our Anniversary. The staff were great, friendly and accommodating. The only partial negatives were, poor Wi-Fi signal, and the elevator was out of order for a few hours. However they were quick to get someone there to get the elevator going in a timely manor. While at the hotel, my wife and I took the the haunted history tour of the Basin Park hotel. Our tour guide Jeff was outstanding, he made the tour worth the price of admission. I've stayed in many 4 and 5 star hotels, and for a hotel that's over 100 years old, this hotel is right up there with what other reviews say about it. 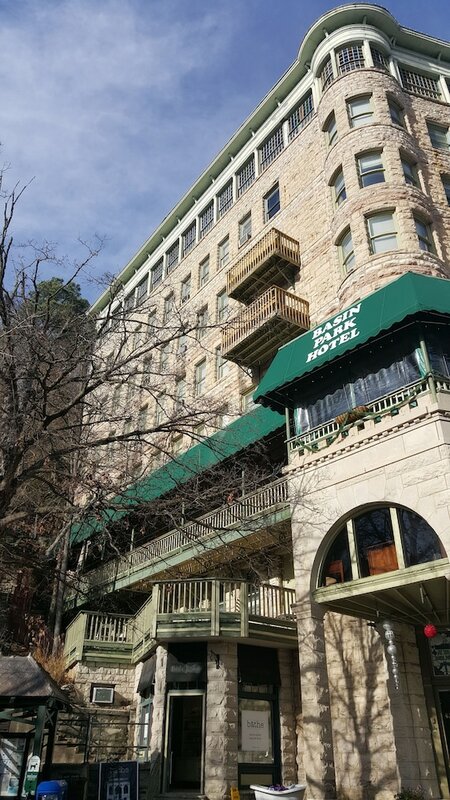 Basin Park Hotel and Spa places you next to Eureka Springs City Auditorium and within a 5-minute walk of other popular sights like Eureka Springs District Court. This 59-room, 3-star hotel welcomes guests with a restaurant, a full-service spa, and free in-room WiFi. Sit down for a leisurely bite to eat at the onsite restaurant, or enjoy a drink at the bar/lounge. Start each morning with buffet breakfast, available for a fee from 8:00 AM to 11:00 AM. Guests can enjoy cable TV and stay connected with free WiFi. Beds sport premium bedding and the bathroom offers a hair dryer and free toiletries. Other standard amenities include a coffee maker, free local calls, and a ceiling fan. A full-service spa, a spa tub, and free WiFi in public areas are featured at Basin Park Hotel and Spa. You can take advantage of free parking, along with a free area shuttle. The front desk is staffed 24/7 to help with luggage storage, and answer any questions about the accommodations. Other amenities at this spa hotel include conference space, a business center, and express check-out. We're sorry you were disappointed with the room. We will look in to updating it at the first opportunity. Have a good day. We're glad you enjoyed your recent stay with us. We hope to see you again next time you return to Eureka Springs. Thank you for taking the time to review the Basin Park Hotel. We truly value the opinions of our customers and we apologize that we did not meet your expectations. Buffet breakfast is served daily from 8:00 AM to 11:00 AM for a fee. Eureka Springs Restaurant - Restaurant and bar serving breakfast, lunch, and dinner. Recreation features at Basin Park Hotel and Spa include a spa tub. The preferred airport is Fayetteville, AR (XNA-Northwest Arkansas Regional): 75-min drive, 49 mi/78.8 km. Night Owl in Downtown Eureka!